VANCOUVER — Clark County invites residents to attend a ceremony at 10 a.m. Sat., Aug. 25, to officially open Otto Brown Neighborhood Park. The park is located on the south side of Northeast 96th Street west of Northeast 162nd Avenue. There will be short remarks, a ceremonial ribbon cutting and light refreshments. Public Works will recognize the park’s general contractor, Catworks Construction of Battle Ground, and others who contributed to development of the 7.9-acre park. Most construction is complete at Otto Brown Neighborhood Park, which already is being used by children and adults from the surrounding neighborhoods. A small amount of work remains, primarily establishing grass, which has been difficult due to the recent stretch of hot, dry weather. Otto Brown Neighborhood Park includes a paved perimeter path, a sports court, playground equipment, picnic tables, a nature play area, benches and other amenities. The park was designed with a natural theme that preserves the area’s vegetation and overall character. The park is named after Otto Alexander Brown, who was born in the Hockinson area in 1878. Brown built a bicycle almost entirely of wood and rode it to Vancouver for the city’s Fourth of July festivities. A Vancouver bicycle shop owner was so impressed that he gave Brown a new bicycle in exchange for the wood one, which he displayed in his store window for years. In 2010, neighbors asked that the park be named for Brown in recognition of making his own bicycle. 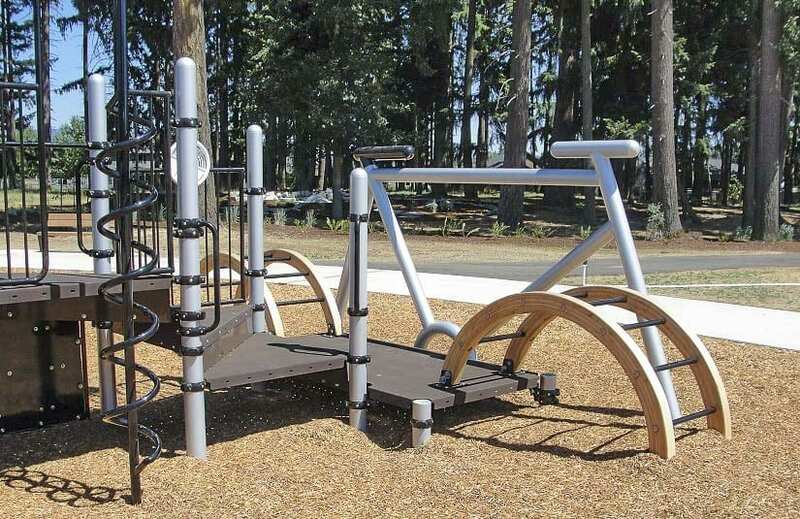 Play equipment at the new park features a bicycle theme. Otto Brown Neighborhood Park is the 31st park Clark County has built since voters created the Greater Clark Parks District in 2005. Clark County has to develop two neighborhood parks, Kozy Kamp and Salmon Creek Community Club, and two community parks, Curtin Creek and Pleasant Valley, to complete the 35 planned parks in the Greater Clark Parks District.